When Bernie Madoff was exposed as a criminal few people understood that many people know that he was running a scam and actively participated anyway. Hopefully we profit from this scam. We are looking for "Madoff like" returns on #10 Ponzi Scheme in Monmouth race 8. Ponzi Scheme slips in for the 3 year old condition while most others race for the non winners of two lifetime condition. Ponzi Scheme has already won 3 times. He drops in class from stakes company and cuts back in distance. At the end of the day we could be the one that made off with the money. Number six Pretty Cozzy here looks like a wire to wire candidate. This filly had some trouble last out "bolted both turns" is not going to get the job done, but perhaps if she is in the mood she can do much better. She certainly has the set-up as she is clearly lone speed; she has every right to assume the role of alpha-mare and take this field unchallenged. She is working well for this race and has taken money every time she has raced. The 10-1 morning line would be great. The poor behavior, the lack of turf success and unknown trainer should guarantee a great price. She could forget to stop this time and light up the tote. We have to feel terrible for the workers and people that rely on New York horse racing to provide their livelihood. If NYRA shuts down on the ninth of June thousands will be out of work. It is a great tragedy that the interests of many were sacrificed at the alter of greed. The source of this failure can be traced directly to the hearts of man. The immorality of politicians is the heart of this tragedy. Plato can rest easy knowing that his political genius is still valid 2400 years later. This tale of woe starts with the failures of governor Pataki. He blocked the MGM casino at Aqueduct and likely had a plan to award the casino to friends. This was the start of a nine year saga. 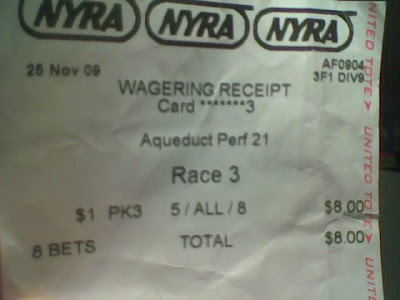 NYRA then became a political football. Publications like the NY Times suddenly began to refer to NYRA as the "beleaguered NYRA" or "corruption ridden" It seems that the media was aiding the aims of the corrupt politicians by serving as their ministry of public opinion. When Pataki faded from view we had the dirty deals of Bruno move to the fore. This is a man how is a great friend of racing at times. He is loved by many. Yet he was convicted for corruption. The there is the hypocrisy of Spitzer, a man who crusaded like he was morally impeccable; but he turned out to be the dirtiest scoundrel of all. This hypocrite went after prostitution while he himself was a frequent john. His crusade against racing was nothing more than a power play to discredit NYRA and hand his campaign donors access to casino gaming. Plato saw Spitzer for what he was 2400 years ago. Perhaps most embarrassing of all is Patterson, whose choice of AEG was a brazen selection of friends and campaign donors to run a casino. Even the backdrop of a state a $10 billion hole could not motivate him to deviate from his personal interest. This repeated lack of discretion is an illustration of the demoralization of America. While the masses dwell on one red herring issue after another a macro-collapse looms. When it takes a decade to build a casino this is a crisis. If the politicians can not disregard their personal interest for a minor issue the major issues will also be sacrificed for personal gain. The politicians had nine years to make this right but greed has rendered them impotent. Now NYRA will likely close. The trainers, grooms and all the other ancillary workers will feel the pain. If you think this crisis is isolated to just Belmont Park you are wrong. This is a foreshadowing of the pain we will all feel as this crisis of tyranny spreads. Monmouth has traditionally been know as a speed biased surface. East To West is a horse that has a few things going for him at a nice price(10-1). He has speed, is cutting back in distance and dropping in class. He is also the only horse in the field to run in the last month . The cutback from 1 3/16ths to one mile should give him the stamina to win a speed duel with Strait Count. Maybe he runs the rest of the layoff horses off their feet. East to West is a coast to coast candidate. Take a look at the Monmouth entries for opening day. 5K claimers run for $30K, maiden specials run for $75K while the purse for N1X is $80K. All of the good barns are present; in fact there is a convergence of horsemen as barns from California, the mid Atlantic and New York converge. In a sport where the success of a venue is tied to its ability to latch onto the welfare dole i.e. slots, it is a refreshing to see clear thinking put to action. This mega-meet will surely attract attention; hopefully the horse fans will recognize excellence and reward it with their wagering dollar. In comparison there is New York, with its political circus of useful idiots, politburo mediocrity and ubiquitous corruption, this is a jurisdiction that could never actualize a plan like "Category-Killer-Monmouth". In New York there is only a collection of individual needs and it is power that holds sway. The common good is not only ignored it is no longer recognizable. All these years of demoralization have brought New York to crisis. The NY racing industry is micro-chasm of the entire state. Former leading owner Paragallo is in jail for animal neglect. It has taken over 9 years and counting to install slots at Aqueduct. Albany has become completely ineffectual; it is a deadlock of competing special interests that can not find common ground. OTB's business model revolves around theft of funds coupled with non-payment of vendors. The once proud NYRA has been reduced to a pathetic beggar, needing loans to remain in daily operation. The only hope is one day slots will come and bail out the whole wretched mess. It is truly a false hope. While New Jersey may also be on the verge of crisis, it is at least is fighting and the ground is fertile enough to sprout a new idea. Governor Christie has enacted a bold plan of action; a plan of action that has a good chance of usurping New York's former glory. New Jersey has a chance to crawl out from destabilization, reverse decades of demoralization and emerge as a functional jurisdiction. New Jersey is setting an example. While New Jersey rises, New York remains mired in demoralization, is doomed to crisis and then obliteration. Slots will never be savior and are only a interim solution leading to slots replacing racing entirely. Will others recognize what is happening and copy New Jerseys plan? Hopefully this Monmouth category-killer track revolutionizes the industry. My early thoughts on the Belmont is that Icebox is not going to win. It looks like there is a virtual consensus that Ice Box will have to fall down to lose the Belmont. The Belmont could be a lucrative betting race with an odds-on chalk with only a small chance to win. The foundation of my opinion is based on Ice Box's issues with lead changes. Horses that can not change leads usually can not go 12 furlongs. It looks like Ice Box was on the wrong lead in both the Florida and Kentucky derby. The Belmont is still three weeks away but it looks like someone with speed is going to have a huge edge with the favorite coming from off the pace. When the real running begins Icebox will be changing gears while the winner kicks away. It has been over one year that I have waited for Pocket Cowboys to be entered on the turf. This silly old game requires the patience of a prisoner doing 20 upstate. The first time I spotted Pocket Cowboys this gelding was a two year old, from the looks of him I thought he would make a fine turf runner. He is a big boy with an imposing presence and big strides. it was these big strides that has helped him win the 2009 New York Derby. Today he takes a drop in class and stretches out to 10 furlongs on the turf. This is the kind of race he is built for. What has Scott Schwartz been waiting for? This is Pocket Cowboys' first turf race since 2008. He washed out badly in the 01APR race; if he is composed today I suggest a power bet on Pocket Cowboys to win today's 10 furlong race on the Belmont inner turf. He could be 10-1 or more.